There are some things in this community that cause a certain level of excitement. The opening of a new coffee shop, restaurant, or pub is pretty likely to generate some buzz since our options are a bit limited in those categories. And the opening of a brew pub where the beer being served is crafted and brewed here? Well, that takes that buzz and makes it into a roar of thunder, because the excitement is tremendous. And that's exactly what I told Socrates Korogonas when I had the chance to speak to him a couple of weeks ago. Socrates isn't new to this brew pub business, having opened now successfully operating brew pubs in both Banff and Jasper (with his partners). Socrates can speak quite passionately not just about running brew pubs but about the art of beer making, and we spent a fair bit of time speaking about that. The other thing he is passionate about, though, is community, and we talked a lot about that, too. First, though, let's talk about the beer. Socrates shared with me a theory that has been put forward, a theory that states that modern agriculture arose due to the discovery of beer. It makes a bit of sense, actually, as in order to make beer one needs the ingredients, and a secure supply of those is best obtained through growing your own. Now, it may seem like a bit of a stretch that it was beer that inspired civilization (and really, agriculture and civilization are intimately linked) but it certainly seems possible. I do know that beer and other alcohol has certainly influenced our social development, both in good ways and bad. The rise of alcohol, the establishment of taverns and pubs - these changed the ways humans socialize and have been a part of our social history for thousands of years, and so too has the art of brewing beer. 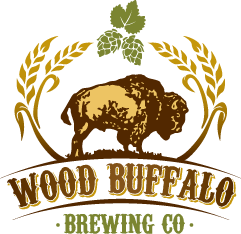 You see the new pub to be opened in Fort McMurray will be called Wood Buffalo Brewing Co. And that's not just a name, people, because the beer being served will be crafted right here, by a brewmaster. And it will be made using local water, filtered only to remove the chlorine. Each of Socrates' brew pubs do this, use local water to make their beer, and so each and every pub serves beers entirely unique to the place it is made. In essence we aren't just getting a brew pub, people - we are getting our very own brews, unique to our region and reflective of who we are. That's one of the things we discussed, too, beer culture and how it reflects the culture of the people who drink it. We talked about how people might have a favourite taste and style of beer, but how they can be encouraged to branch out into other tastes and styles if they are introduced to them, and this is one of the things Socrates and his partners plan to do with our local beer culture. First they want to learn what sort of beer is being consumed here - and then they want to help local beer drinkers to expand their palate, discover new styles and tastes, and explore the world of beer crafting. And then we spoke about community, which is where Socrates got me. As everyone who reads this blog knows I am passionate about community, and so is Socrates. He told me about his sense of our pride in our region, and about how he wants people in this community to "take ownership" of the new brew pub, to see it as part of the community. He told me that he sees us as a unique and passionate set of people, and that he wants us to be as proud of the brew that will have our name as he will be. And he told me that he wants to be involved in our community, to become a part of it and get to know us. Socrates speaks with passion and fire, and not just about beer or business, but about community, and frankly that outranks both beer and business for me. By the end of the conversation he and I were chatting like old friends, and I knew that he would fit so well into our culture, both of beer and community. I asked him the question I have been asked about the brew pub, which is "When will you open?" - and his response was one that both surprised and pleased me. He replied that they would open when they are ready, when they have enough beer brewed to meet demand, when the product is one of which they can be proud, and when they know they can do this well. As Socrates says "you don't get a second chance to make a first impression", and he intends to make this first impression a very lasting, and positive, one. And that, people, is what Socrates did for me, too. The first impression I walked away with was overwhelmingly positive, not just about the Wood Buffalo Brewing Co but about the people running it. I walked away with the sense that Socrates and his partners aren't just about beer (although never doubt their passion for that subject, as I don't) or business, but also about community and commitment to excellence in all areas. I am terrifically excited about the opening of the new brew pub, but I am tempering my excitement with patience as I know that good things take time, and I am willing to wait. I know that you never get a second chance to make a first impression, and I know that if the new brew pub is at all reflective of Socrates Koroganas then it will be the kind of positive first impression that lasts for a very, very long time.